I combined several ideas and minis from several places for this project. Some manufacturers are producing plastic/resin minis using colored plastic that is translucent and looks pretty nifty. The one that started this project for me was the Reaper Bones fire elemental. I liked the look of the colored plastic, but it was kind of hard to make out the details in the sculpt. I didn’t want to prime it with white or black paint, as priming would wipe out the translucency, so I started by coating it with Vallejo brush-on matt sealant. The matt dries clear and also creates a surface that is more accepting of paint than just plain Bones plastic. *Reaper, the manufacturer of Bones, claims you can paint straight onto the unprimed Bones material without priming; you can, it just looks like poo to me. Next up was a coat of a deep red that mainly hit the high areas as I wanted the red plastic to show in the crevices. Then my nice bright orange going lightly over the red painted areas. Then Yellow over the orange, but not as heavy as either of the two previous colors. The finishing step is to highlight with a 50/50 mix of yellow and white and only touching the high points on the sculpt. I liked it! I then dug through my box of minis and found another couple of fire elementals from Reaper also made with the translucent red plastic. Then I remembered that in my Arena of the Planeswalkers set Chandra’s minions were made of a similar material. Here are the Flame Cats and Phoenixes just before they received the final yellow-white highlight. Here is Chandra, a Red and fiery Planeswalker from Magic the Gathering, with her flaming minions. Her hair kind of disappears. She came pre-painted but I need to do a little bit of highlighting. Here are all of the fire projects with some black sand added to their bases. This entry was posted in Miniatures, Painting and tagged Bones, Heroscape, Magic, Paint, Reaper Minis on May 21, 2017 by squirmydad. This episode brought to you by Vallejo Matt Varnish, the brush on kind! One of the difficulties of miniature painting in Alaska is that spray matt doesn’t like being applied in cold temperatures. It’s April, but we still have frost on the windows in the mornings and spray matt can get cloudy and screw up a paint job. I found out that Amazon sells Vallejo paints, which is great as the local shops don’t have them. There’s no odor so it can be used indoors and dries clear. It goes on cloudy and shiny, but don’t worry, dries clear remember. It was also very handy to be able to get a brush into some of the hard to reach areas, like arm-pits. That was fun, back to Avenging now. This entry was posted in Miniatures, Painting and tagged Heroscape, Paint on April 3, 2017 by squirmydad. This entry was posted in Miniatures, Painting and tagged Heroscape, Paint on March 11, 2017 by squirmydad. The Eldrazi Scions are also done, although my son tells me that the paint scheme I used for the Scions would be fine for the Endless One, but Scions as depicted in the game art have a lot more color variety. Ah well, at least they all match. I’m still working on the Eldar Howling Banshee troops and an old gaming friend of mine said I was wrong and that the one time he used them they performed great….then he thought about it and remembered they had gone up against a unit of Gretchin, and had emerged triumphant! Of course they did, they were fighting Gretchin. After they’re painted up I’ll have to try fielding them and see if they can do anything other than sing off-key. This entry was posted in Miniatures, Painting, Uncategorized and tagged Eldar, Heroscape on March 9, 2017 by squirmydad. 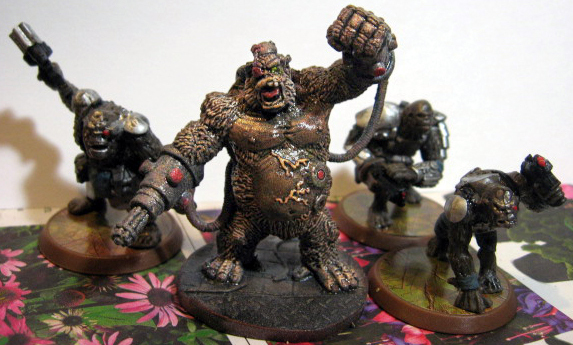 My Heroscape Gorillanoids have a big brother heavy now, I’ll have to come up with a Heroscape stat card and maybe a Mutants and Death Ray Guns version of these guys too. Work also continues on my reptillian forces; I cleaned up a few more of the ebay lizardman rejects I bought a while back and also purchased a Reaper Reptus Skullbreaker, sculpted by C. Elliot. Why is he red? Well, when the order arrived this bottle of paint was in the box with a note from Reaper minis saying “Surprise!” as they’ll randomly gift customers with little prizes like this. I wanted to see what the quality of their paint was like so the Skullbreaker became the test subject. 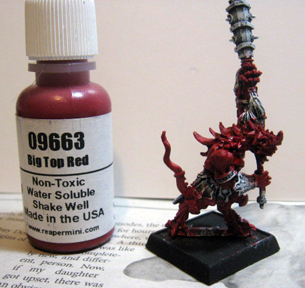 The paint is in a dropper bottle, goes on smooth and looked really thin at first, I thought I’d need to do a second coat of the red. When the red dried it was much darker and shinier than I’d initially expected it would be. Quite a pleasant surprise all ’round. He still needs a little bit of highlighting and detailing but I’ll come back to him in a bit. 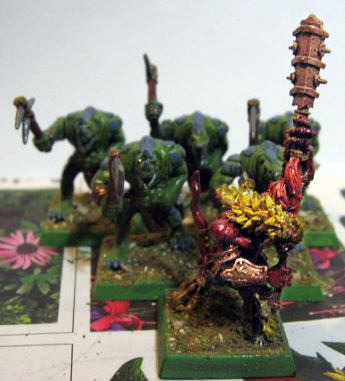 This entry was posted in Miniatures, Painting and tagged Heroscape, lizardmen, Miniatures, Reaper Miniatures on July 13, 2013 by squirmydad.